Nothing says summer more than grilled hot dogs, cold lemonade and baseball. Yes, baseball, that most American of past times. Brought to the United States by British immigrants during the eighteenth century, the game as we know it, evolved throughout the nineteenth century. 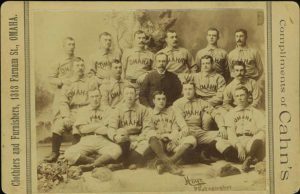 While smaller leagues sprang up around the country, professional leagues didn’t take root until the 1870s. Like other areas, Nebraska colleges and towns fielded baseball teams. In fact, the state has been home to numerous minor league teams. 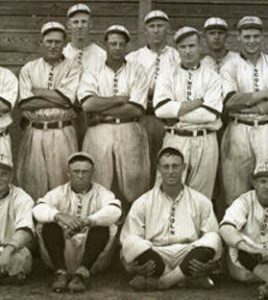 During the first half of the twentieth-century, Lincoln’s Baseball Club was a member of the Western League, which also included a team from Omaha. 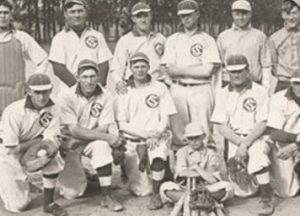 To see more photographs of Nebraska baseball teams, visit Nebraska Memories to search for or browse through many more historical images digitized from photographs, negatives, postcards, maps, lantern slides, books and other materials. Nebraska Memories is a cooperative project to digitize Nebraska-related historical and cultural heritage materials and make them available to researchers of all ages via the Internet. Nebraska Memories is brought to you by the Nebraska Library Commission. If your institution is interested in participating in Nebraska Memories, see http://nlc.nebraska.gov/nebraskamemories/participation.aspxfor more information, contact Devra Dragos, Technology & Access Services Director. This entry was posted in Nebraska Memories. Bookmark the permalink. ← Throwback Thursday: Lutheran Church, Beatrice, Nebraska.